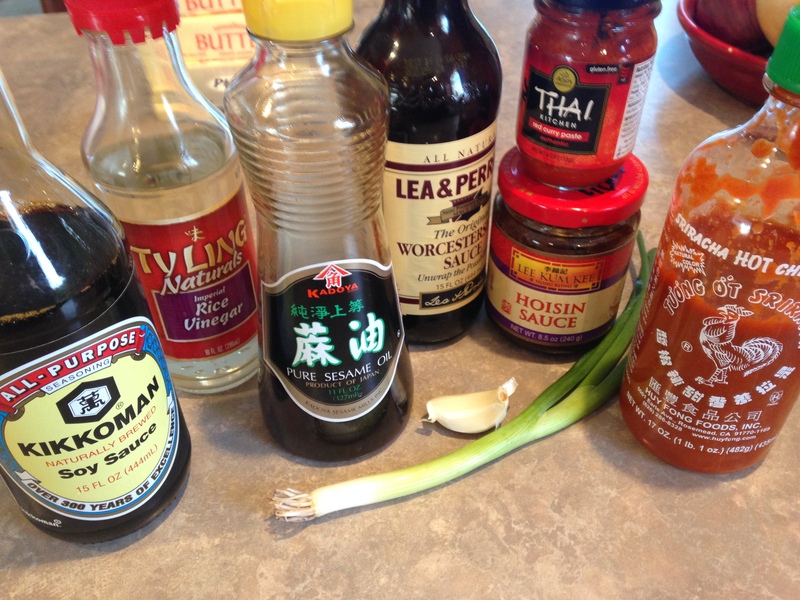 Asian Flavored Burgers – Simple and Delicious! I am tired of hamburgers with salt and pepper as seasoning. 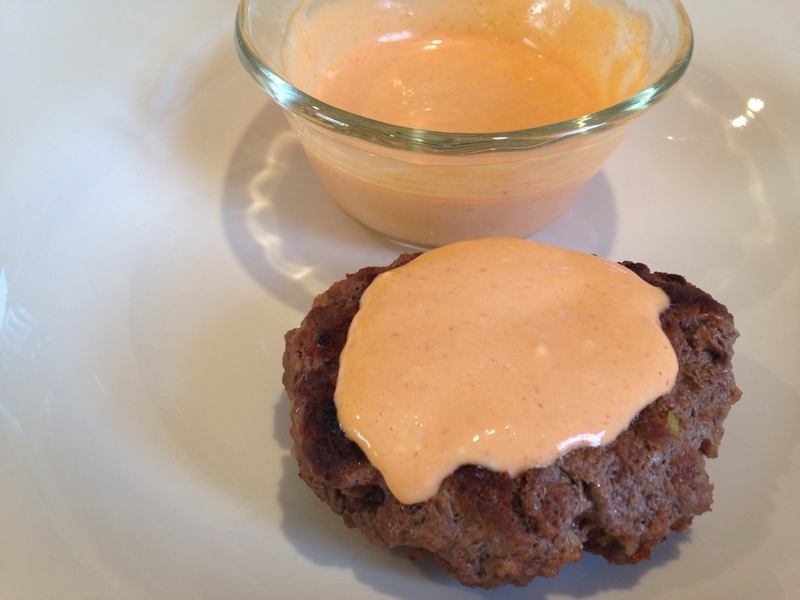 I have been making different combos for hamburgers. I needed a quick meal tonight as I had some baking I needed to get done! Here is what I threw together. By the way, I love sriracha sauce! Mix all together. You could barbecue (I would if we had one. Need to buy another and NOW!) or put 1 Tablespoon peanut oil (or whatever you have) in a skillet. Fry on each side for 4 minutes. Serve with or without a bun. No bun for me. I used a combo of mayo and sriracha sauce as a topping. 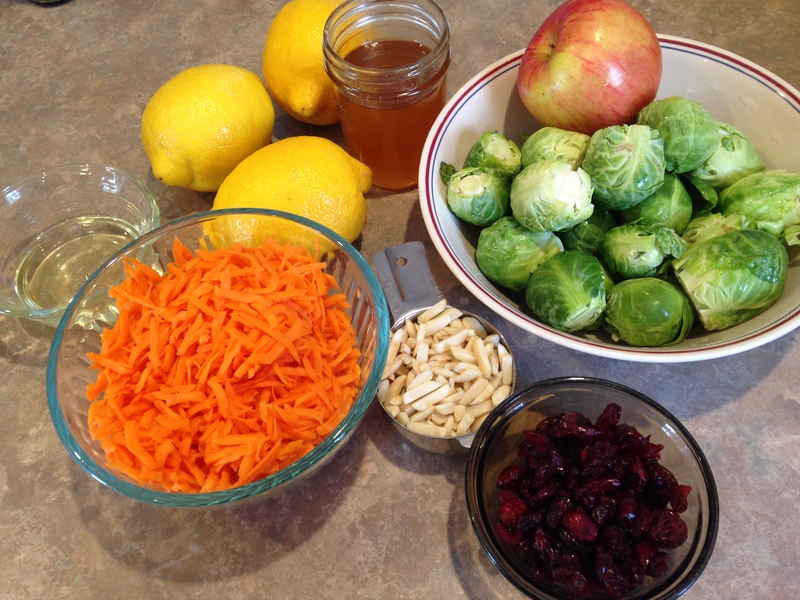 Mix together and serve on any sandwich you would like! Kent and I enjoyed these flavorful burgers. I think you will too!! 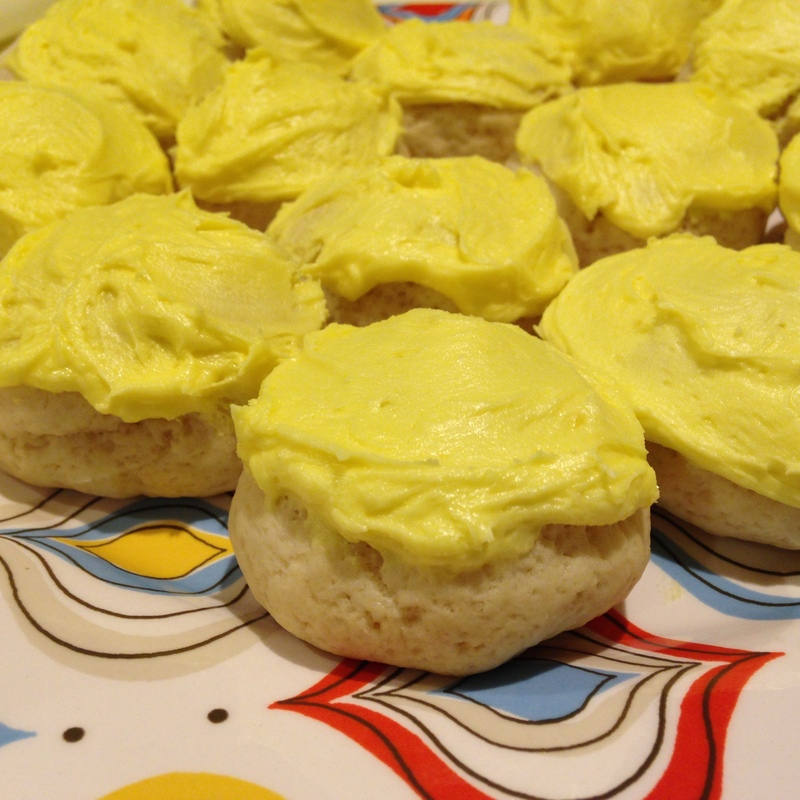 This is my Italian lemon cookie recipe with some tweaks. I am finding I like to change things up to see if I can improve what I have done for so long. I think that my old recipe is delicious and so is this one. I am a huge fan of lemon though. 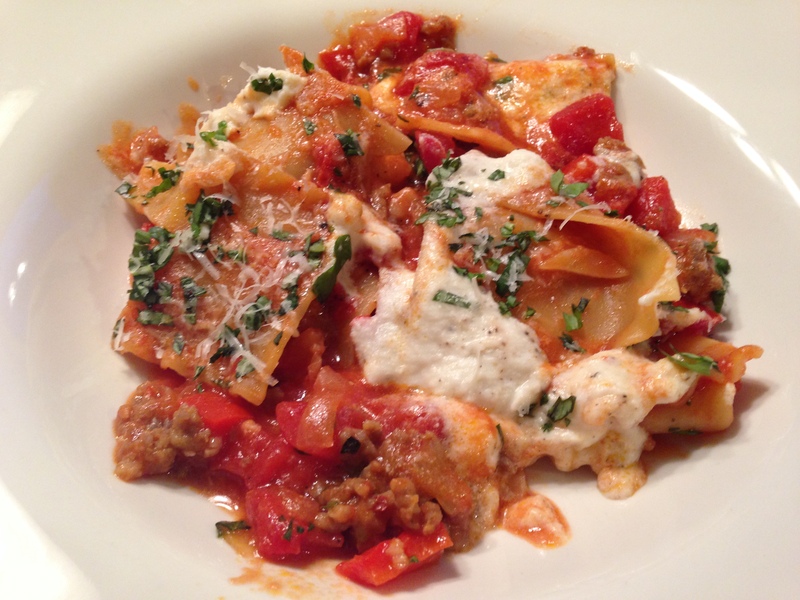 Here is my updated recipe. Oh, and the frosting is super creamy. LOVE IT!! Cream together shortening and sugar, cream in eggs. Dissolve baking soda in with the sour cream/half and half. Mix all ingredients together. You can chill this dough. I do not chill the dough. I use a teaspoon and roll the cookie dough into a 1″ diameter ball. I place on parchment lined cookie sheet. You could just place on a non stick cookie sheet, no need to grease the sheet. 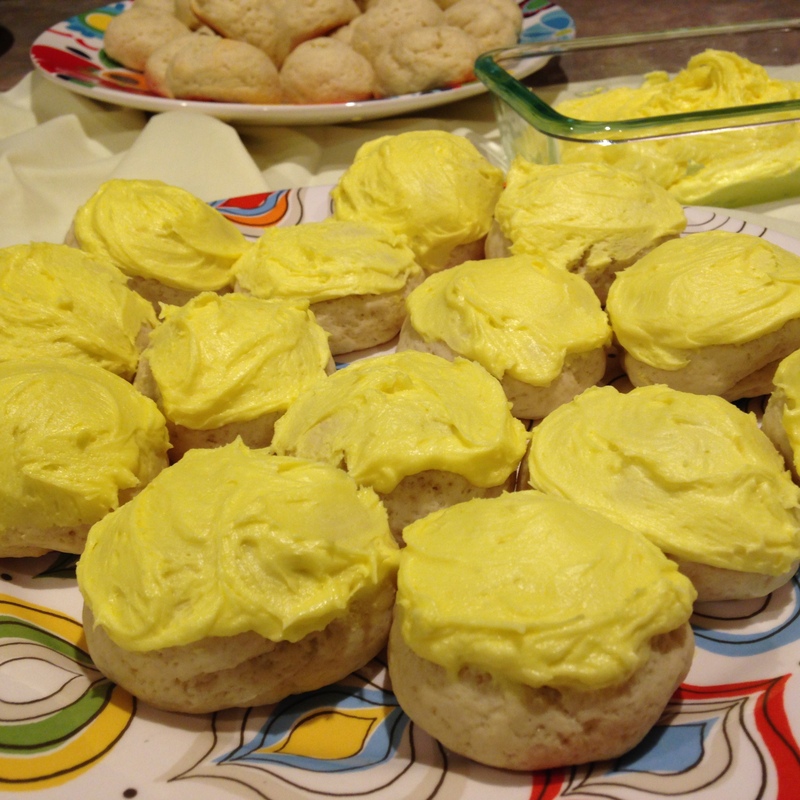 When cooled frost with lemon frosting or glaze. I used frosting for these cookies. Fun any time of year! Cream together the butter and lemon rind. Mix rest of ingredients with electric mixer. (I did not use my stand up mixer today. I will next time though). This is fast and incredibly creamy and delicious!! Isn’t yellow pretty?! Enjoy!! Spring is here and so is asparagus. 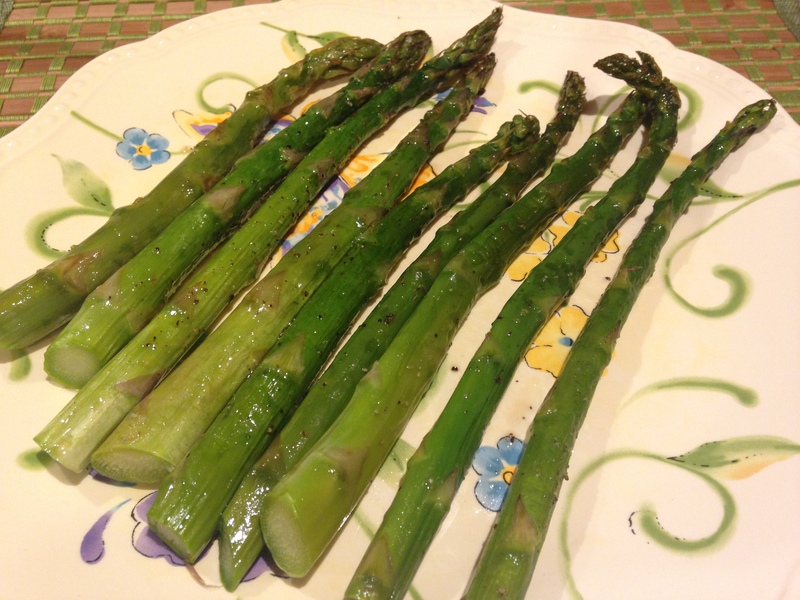 I enjoy asparagus raw, grilled and roasted. Here is how easy it is to roast asparagus. I also roast brussels sprout. Preheat oven to 425 degrees. Line a baking sheet with foil. I spray with Pam or you could lightly brush oil on the foil. 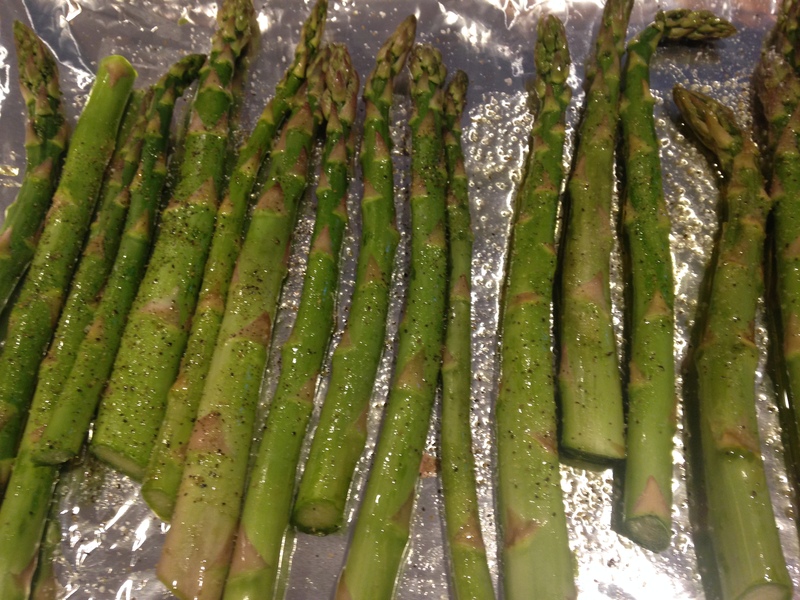 Place asparagus on baking sheet and brush 1 Tablespoons of olive oil over the stalks. Season with kosher salt. Bake 10-15 minutes, until lightly browned. That’s it. Now this is Simple and Delicious!! I really try hard to make a weeknight meal. By the time I get home it is close to 6. If I can whip something up in under an hour that makes me happy. If it is delicious that is even better. 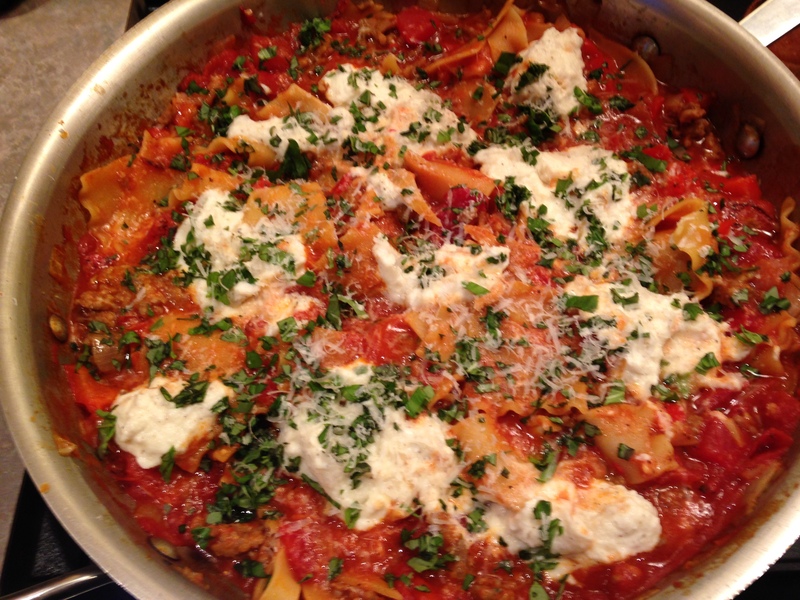 I found this recipe, where else….America’s Test Kitchen. I find using ground sausage vs ground beef makes the sauce way more flavorful. I think you will agree!! 2. Heat oil in large nonstick skillet over medium heat until shimmering. Add onion, bell pepper and 1/2 teaspoon salt. Cook until onion begins to brown, about 5 minutes. Stir in garlic and pepper flakes and cook until fragrant, about 30 seconds. Add sausage and cook, breaking apart the meat, until no longer pink, about 5-8 minutes. 3. Scatter broken lasagna noodles over sausage but do not stir. Pour diced tomatoes with juices and tomato sauce over pasta. Cover and bring to simmer. Reduce heat to medium low and simmer, stirring occasionally until past is tender, about 20 minutes. 4. Remove skillet from heat and stir in 1/2 cup (I used 1 cup) Parmesan. Season with salt and pepper. Dot with heaping tablespoons ricotta (I did season the ricotta with salt and pepper), cover and let stand off heat for 5 minutes. Sprinkle with basil and Parmesan cheese. Enjoy this Simple and Delicious dish!! I saw this recipe and couldn’t wait to make it. I thought it was amusing that it was on Cooking Light’s website. There is really nothing “light” about this recipe. I don’t believe in no fat or low fat products so I used full fat cream cheese. I suppose 2 cups of carrots could be considered light! This was a quick recipe. I ended up doing 2 batches. I only got 18 cookies which turned into 9 since they are sandwich cookies. I brought these to work and they loved them. My family enjoyed them also. Give this simple and delicious cookie a shot!! 1. Preheat oven to 350 degrees. Place parchment paper on baking sheets. 3. Melt 2 tablespoons of butter in small bowl. Add oil, 1/2 teaspoon vanilla extract and egg; stir with a whisk until well combined. 4. Place flour, remaining brown sugar, cinnamon, 1/4 teaspoon salt, and baking soda in large bowl; stir with whisk. 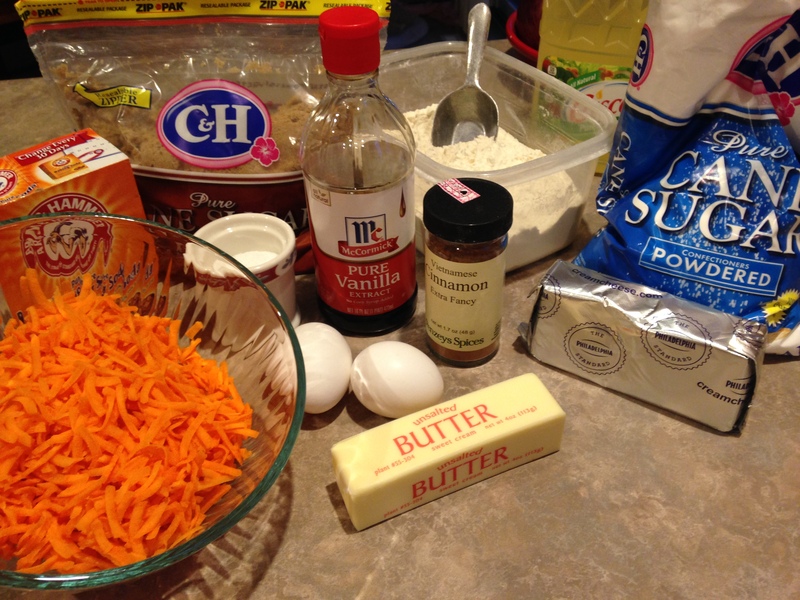 Add carrot mixture and butter mixture; stir until combined. 5. Drop dough by 1 Tablespoonful, 2 inches apart on parchment lined baking sheet. 7. Remove pans from oven; let stand 3 minutes. Remove cookies from pan onto wire rack. 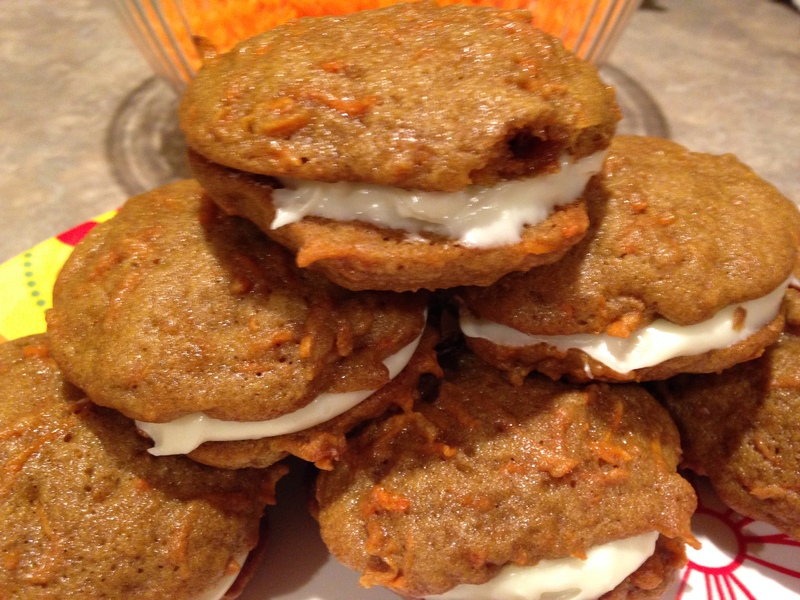 These tasted like a mini carrot cake. They were really easy and took no time at all. Enjoy! With Spring in the air, at least it should be, salads are on my mind. I want to start making different salads. I found this recipe and thought it looked interesting so I wanted to give it a try. It was very simple and just as delicious. Let me know what you think! 1. Combine all the salad ingredients in a bowl. 2. In a small bowl whisk all the dressing ingredients together. 3. Pour dressing over the salad and toss well. 4. Put the salad in the fridge for 30 minutes or so. That will give the flavors time to marinate. Kent had the salad right away. He thought it was great. I waited 30 minutes and I liked it better after sitting in the fridge. Very refreshing salad. 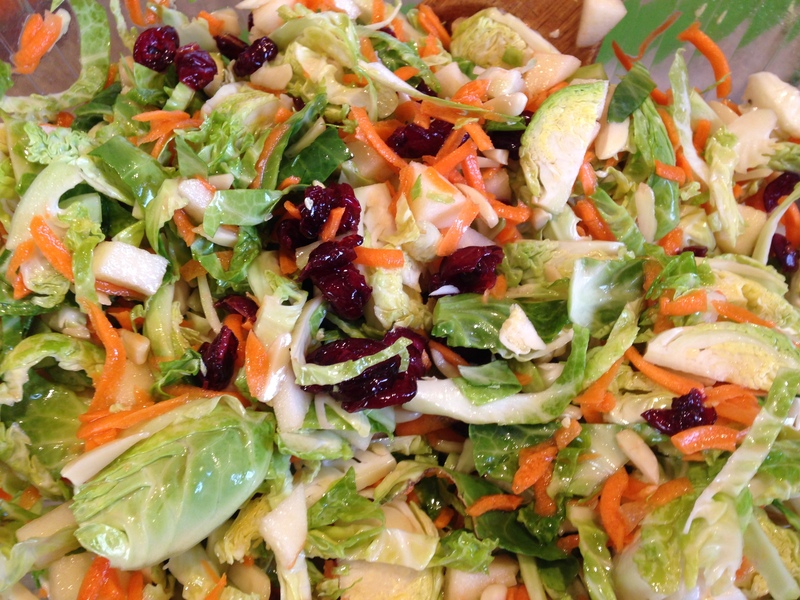 Looking forward to making many more new salads this year.Enjoy! !